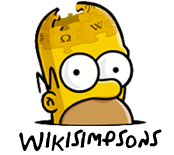 Wikisimpsons is an encyclopedic wiki that contains information regarding the The Simpsons episodes, comic books and other media, including characters, locations and more. Wikisimpsons Answers - A site where you can ask questions about The Simpsons. The Springfield Shopper - A Simpsons-related news blog run by Wikisimpsons. Svenska Wikisimpsons - The Swedish wiki about The Simpsons. Simpsonspedia - A german wiki about The Simpsons and our affiliate. You can contact Wikisimpsons team members through email. They should be able to take care of any problems or questions related to the wiki. For questions related to The Simpsons, ask on Wikisimpsons Answers. For general support or inquiries, you can also email support@simpsonswiki.com. Wikisimpsons' content is available under the Attribution-ShareAlike 3.0 Unported (CC BY-SA 3.0) license. If using content from Wikisimpsons, you must link back to us clearly on the same page. This can be done in any format as long as the link is clearly visible. Modified on November 30, 2016, at 21:30.